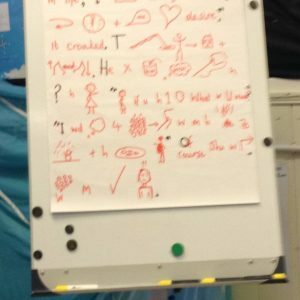 In 2014 Hevingham and Marsham Primary Schools were lucky enough to be involved in a two year project with Pie Corbett to firmly embed the Talk for Writing process across both our schools – below you can find a broad outline of the method used there are also some useful links to videos at the foot of this page. Demonstrating how to regularly read your work aloud to see if it works is important here. This process enables the children to write their own versions through developing their ability to generate good words and phrases and also, hopefully, develops the inner judge when they start to decide why one word or phrase is best. If, during this process a teaching assistant (or in KS2 an able child) flip-charts up words and phrases suggested, these can be put on the washing line alongside the shared writing so when the children come to write they have models and words and phrases to support them. Throughout the shared writing, the children should be strengthening the toolkit so they start to understand the type of ingredients that may help. Once they have finished their own paragraph/s children should be encouraged to swap their work with a response partner. Then with the aid of a visualiser, the whole class can also discuss some of the more successful work. Time now needs to be found to enable the children to give their own work a polish in the light of these discussions and perhaps to begin the dialogue about what works by writing their own comment on their work for the teacher to comment on.